The names “prawn” and “shrimp” are often used interchangeably – what differentiates them is their gills. Shrimp have branching gills while prawns have lameller gills (source). To be honest, I have no idea what that means and don’t have much interest in finding out. I only know they are delicious! 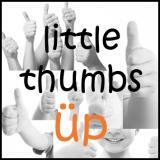 I have wanted to make prawn bisque for a very long time, but was always too lazy to get down to it – but I decided to give it a go for the Little Thumbs Up event! 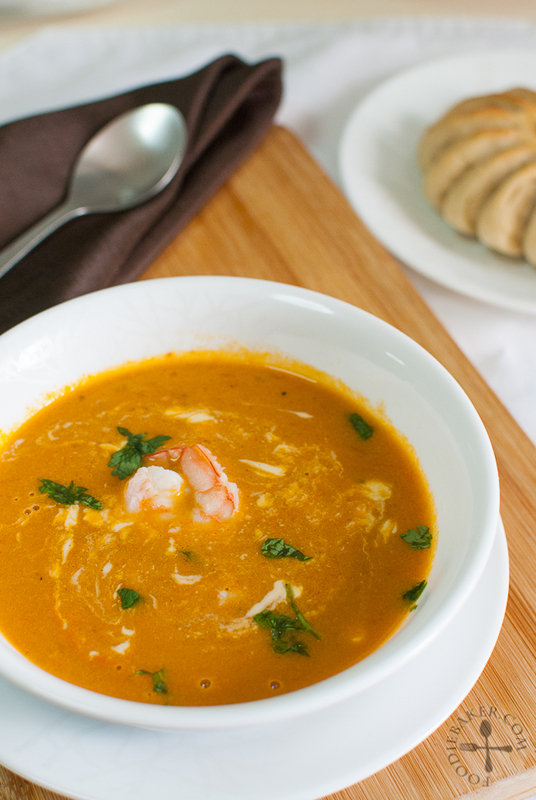 Bisque is a smooth and creamy French soup, usually made with crustaceans. 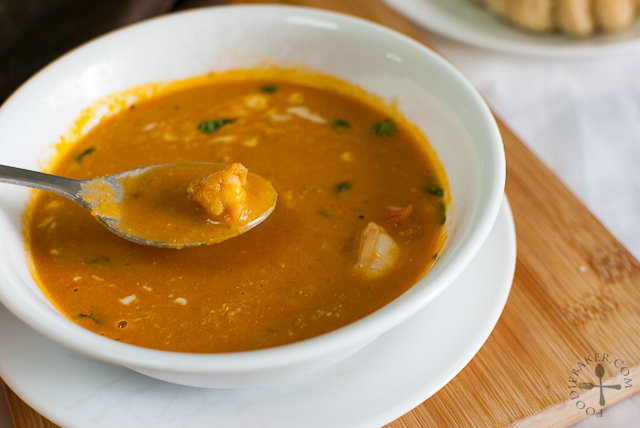 The shells of crustaceans are roasted and then simmered to create a delicious soup base. 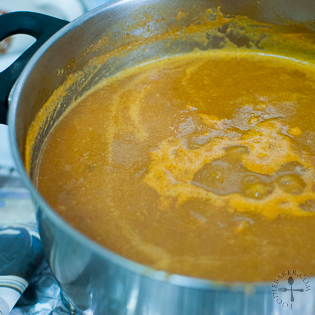 Traditionally, it is thickened with rice, but modern bisques are now often thickened with roux (source). While browsing for recipe, I decided to adapt mainly from these 2 recipes – UK TV and Simply Delicious – keeping the recipe simple so that I don’t have to get rarely used ingredients such as paprika. The most tedious part of the recipe is probably the peeling and de-veining of prawns as well as the chopping of vegetables. The rest of the steps are a breeze! I really love how this soup turned out – it’s creamy but not too overly so, just the right creamy consistency for me as I’m not a super huge fan of overly creamy soups. It is chokeful of prawn flavour – no part of the prawn goes to waste (except for the feelers which I snipped off). 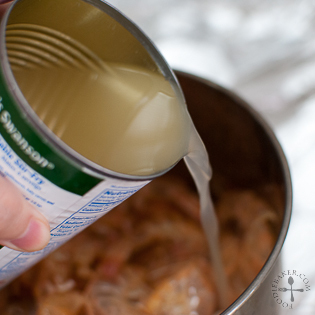 I will definitely whip up a huge pot in the future so that I can freeze some for a quick meal! 1) Melt butter in a small pot. 2) Add in prawn heads and shells and sauté. 3) Add in chicken or vegetable stock and simmer. 4) Blend the prawn heads and shells. 5) Strain and squeeze out every drop of the prawn essence. 6) Sauté the prawns in oil and butter. 7) Remove and set aside. 8) Sauté onion, carrot and celery in oil and butter. 9) Add in tomato paste. 10) Stir it around and add in chopped tomatoes. 11) Pour in the prawn essence and more stock. 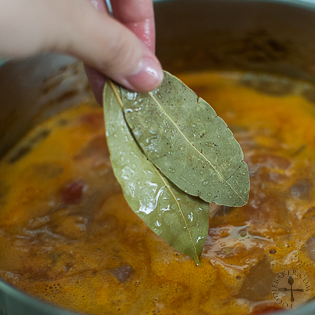 12) Add in bay leaves and simmer. 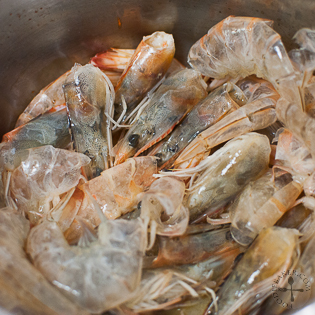 13) Blend the soup with half of the cooked prawns. 14) Add in cream, remaining cooked prawns and season. Love the chunky bits of prawns in the soup! I’m also going to submit this to Little Thumbs Up organised by Doreen from my little favourite DIY and Zoe from Bake for Happy Kids. 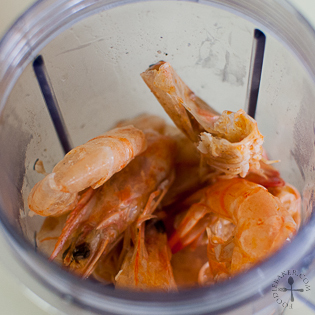 This month’s theme is Prawns – hosted by Food Playground. The recipes are all linked at this post! Snip off and discard the prawn feelers. Peel the prawns, reserving the prawn heads, claws, shells and tails. De-vein the prawns, rinse and rub with corn flour and salt. Leave it aside for 3 minutes then rinse the prawns. Rubbing the prawns with corn flour and salt makes the prawns firmer and "crunchier". Dice the prawns into small pieces, leaving a few pieces whole for garnish. 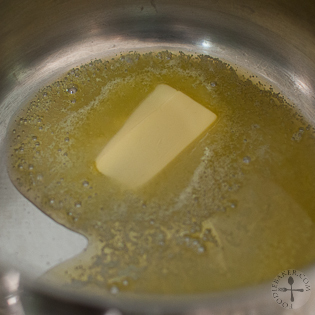 Heat the butter in a small pot over medium heat, until the butter has melted and started to foam. Add in the prawn heads, claws, shells and tails. Sauté until the prawn heads and shells turn red in colour, bashing the prawn heads to release the flavours. 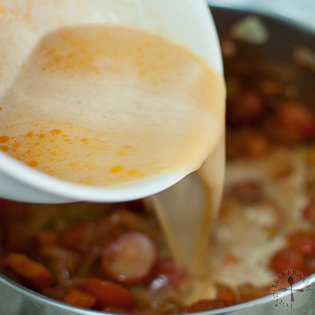 Add in the 2 cups of stock and bring it to a simmer. Cover and simmer for 15 minutes. Turn off the heat and let the essence cool slightly. Place the essence in a food processor and blitz well. 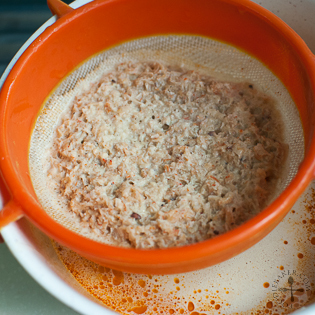 Drain the essence over a sieve, pressing down with a spoon to extract every bit of prawn essence. 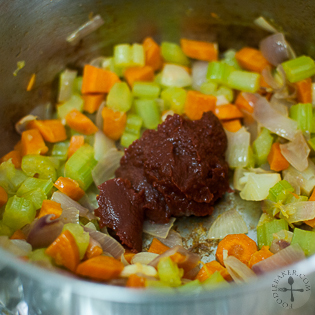 Discard the solids and set the essence aside while preparing the Soup Base. In a large pot, heat 1 tablespoon each of butter and oil over medium heat until the butter has melted and started to foam. Add in the prawns and sauté until the prawns are cooked. Remove the prawns and set aside. 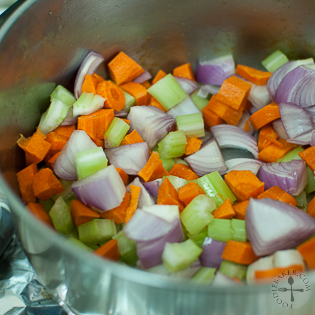 Heat the remaining butter and oil and add in the onion, carrot and celery. Sauté slowly over medium-low heat until onion is translucent and the mixture is soft and fragrant, about 5 to 8 minutes. Make a well in the middle of the mixture. Add in the tomato paste and mix with the vegetables. 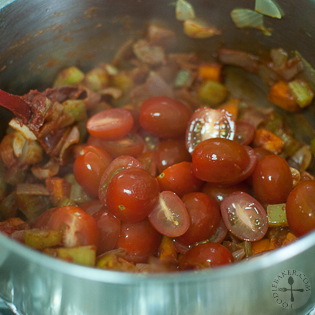 Add in the tomatoes, followed by the Prawn Essence, 4 cups of stock, bay leaves and ½ of the chopped prawns. Bring the soup to a simmer. Cover and simmer for 30 minutes. Remove the bay leaves. Blitz the soup well in a food processor. 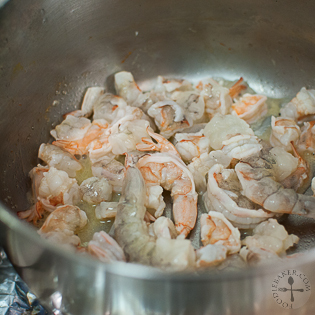 Stir in the remaining chopped prawns, bring to a simmer once again then stir in the cream. 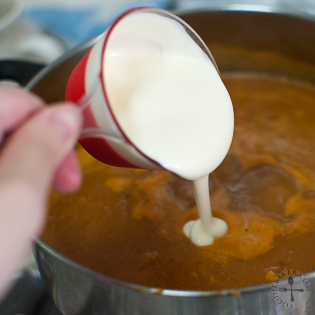 If you'd like the soup to be thicker, make the roux by mixing the butter and flour together and add it into the soup to thicken. Season with salt and black pepper. Scoop the soup into a serving plate, garnish with the whole prawns, additional cream and chopped parsley. Serve immediately with crusty bread. Don’t be put off by the long list of ingredients and instructions! I tried to be as detailed as possible when writing down the recipe hence it’s so long. 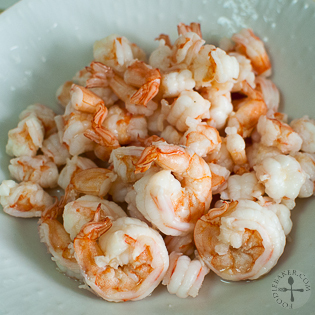 The recipe is actually pretty easy to prepare, just that you need some time peeling and de-veining the prawns. Do read through the recipe a few times, have a mental idea of what you need to do and prepare all the ingredients before you start cooking. This keeps things organized and you will less likely to panic! The prawns’ flavours are maximised by infusing the prawn heads and shells into a stock; with some of the prawns being blitz into the soup. 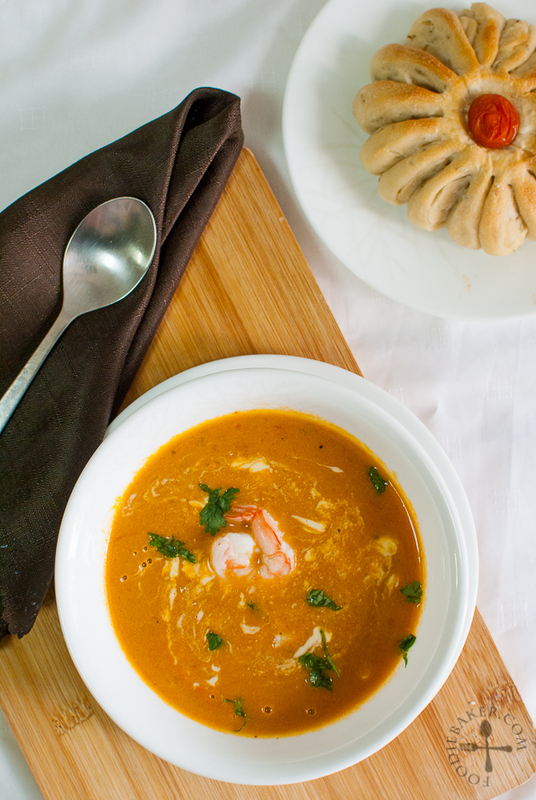 Chopped bits of prawns add a different texture to this delicious soup. Add in a little roux if you find that the soup is not thick enough. I like the consistency of the soup so I didn’t add any roux – personal preference! Definitely to die for. I want to try making. Thanks! Sounds so delightful, I’m going to pin this! Thanks for the step by step tutorial Jaseline, very helpful . 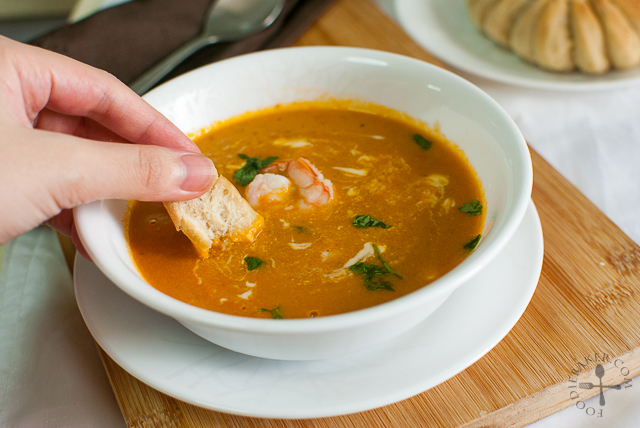 Your prawn bisque is simply irresistible! Thanks so much for sharing your wonderful recipe to LTU! Your bisque must have been so full of flavor…it looks great. Hi Minzhi, sorry for the late reply! I’m afraid milk is not a suitable substitute as it will not help to thicken the soup. Use thickened cream or double cream. The brand I used was Bulla thickened cream. Greenfields thickened cream will work well as well! I love prawns. This bisque looks delicious. What a gorgeous and mouth-watering dish! I would finish the whole bowl clean! It looks really delicious!